I suppose we all like a little nostalgia from time to time. Listening to Infernö and Gehenna in the 1990s gave one a little taste of that moment of the first time you dropped the needle on Hell Awaits, or the day you got the Exodus demo in the mail. There will always be a place in the metal world for bands that recall the halcyon days of thrashmetal in the mid-1980s. It’s a sign of the essential quality of that music. On the other hand, there was a lot of mediocre metal in those days, and I suppose that I shouldn’t be surprised that that is getting revived as well. For your consideration, I offer Warbringer’s most recent release, Worlds Torn Asunder. I must admit that the enjoyed the first couple of Warbringer discs. For me, they were a throwback to bands from the 1980s like Dark Angel: they were enjoyable for a couple of listens but they never quite had the quality of songwriting to lift them into the top level of thrashmetal elite. 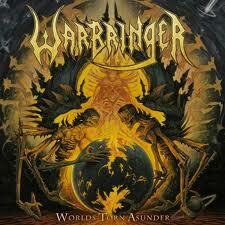 Warbringer demonstrate mastery of a lot of the fundamental elements of the genre. There is a lot of double bass thumping and damped chugging. The vocals are gruff, but clean enough such that you can understand what is being said. So what’s not to like? Well, for starters, there’s not a great deal of progression across their catalog. This might strike some as a sort of an odd expectation for a band whose stock in trade is 1980s atavism. However, it’s one thing to like the style, and another to be satisfied hearing the same record over and over again. If you put the first three Warbringer discs on shuffle, you will be hard pressed to figure out for sure which songs come from which record, unless you are one of those brave souls who have conceded enough of your life span to recognize each song individually. Warbringer’s most recent offering is, it must be said, a bit more varied than previous releases. It is nonetheless the case that they are sort of trapped by the format. Essentially, there are three stylistic choices for a band like this. They go more technical. Alternatively, they can take the At the Gates route and up the level of brutality. (If you’re wondering about that reference, just listen Slaughter of the Soulnext anything else that At the Gates released). Or they can just wallow in the style that they’ve been doing so far. Clearly, it is this third choice that they have gone for. Once again, atavism isn’t a bad thing in and of itself. The thing that differentiates bands like Infernö and Gehenna from Warbringer is that their atavism consisted in an effort to take the format back to it’s roots, thereby to recapture some the rawness and intensity that had been lost by subsequent purveyors. Warbringer was a throwback to a style that is already fully developed and plunging headlong toward decadence. It’s like trying to renovate rock and roll by starting a Genesis cover band. In spite of all of this, it must be said that Worlds Torn Asunder is not a bad record. Even with the significant lineup changes that Warbringer have gone through in the last couple of years, they have retained their core sound and technical consistency. What it comes down to is a calculation that each listener must make between love of the style itself the actual quantity of one’s lifetime that should be devoted to hearing the same old thing. Given the choice, I’ll probably just listen to Hell Awaits again. This entry was posted on June 16, 2012 at 2:57 pm and is filed under Reviews with tags dark angel, slayer, thrash metal, warbringer. You can follow any responses to this entry through the RSS 2.0 feed. You can leave a response, or trackback from your own site.